Scuba diving in South Africa is already a thrilling way to spend time enjoying the great wide ocean. But if you’re looking for an aquatic encounter of the otherworldly kind, then a night dive is an experience you must add to your list. Night diving adds a whole new dimension to life underwater – the colours are more vivid for starters and you’ll get an opportunity to see the spectrum of nocturnal sea creatures that come out to play when the sun goes down. 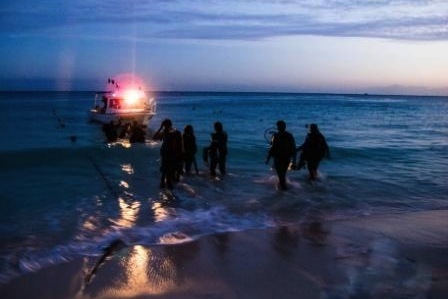 Scuba diving at night in South Africa does require you take extra safety measures as your visibility is obviously more limited than during the day. First off you will need a primary handheld light and, just in case, a smaller backup flashlight that can easily be stowed on your person. And be sure to use a lanyard to secure your primary light to your weight belt because if you drop it, chances are it’ll be lost to the ocean depths forever. Being able to communicate clearly with your dive buddy is also vital on a night diving excursion so to brush up on your hand signals beforehand. Remember you’ll need to illuminate your hand so your dive buddy can see your signal. Or practice making signals with your light. For example, move your light in a circle for “okay”; up and down for “yes”; and side to side for “no”. Night diving is an excellent way to experience the best that scuba diving in South Africa has to offer. But it does require you to pay extra attention to detail. It’s always advisable to do daytime dive recon beforehand or go with an experienced dive buddy who is familiar with your night dive site of choice. Or sign up for PADI’s Night Diver Specialty course to learn all the do’s and don’ts for a successful and safe night excursion into the deep. For more information about scuba diving at night in South Africa, visit Scuba Scene or go to its online store – underwater.co.za – and sign up for the PADI Night Diver Specialty course today.